SEE END OF ARTICLE FOR UPDATE. Several years ago, I spent some time reading Larry Sevick’s book, Transmission Line Transformers, because I was curious about balun (Balanced to Unbalanced matching) transformers and how they worked. I don’t remember all the fine details, but I did wind several small baluns for use around the shack. Some of these were to match a Beverage low-band receive antenna. One balun was to match a 450 Ohm ladder-line fed, 135 ft dipole antenna that was reputed to work on all HF bands. I had to use my Icom’s antenna tuner to use the antenna. It worked just fine. The balun was used between the Icom’s output, and the ladder line input, and had to handle at least 100 watts CW. Now, I am putting together a travel kit of my KX3 transceiver, keys/microphone, power supply, and antenna system. I intend to use a light weight, portable Off Center Fed Dipole (OCFD), and the design requires a balun to match the coaxial feed line. That’s where my QRP 9:1 Balun from Palomar Engineers comes into play. Palomar Engineers has a comprehensive line of baluns, some already in enclosures ready to be installed into an antenna system. I compared the Home Brew 9:1 balun and the Palomar QRP 9:1 balun using an MFJ 225 Antenna Analyzer to measure each balun installed in the same antenna. The characteristics, surprisingly, are different. So, what’s going on? As you can see from the photos of the two devices, there are substantial differences in the construction. The Home Brew Balun uses two toroidal cores, and the Palomar Engineers uses only one ferrite core ( not toroidal). All the same, the analyses should be very close. 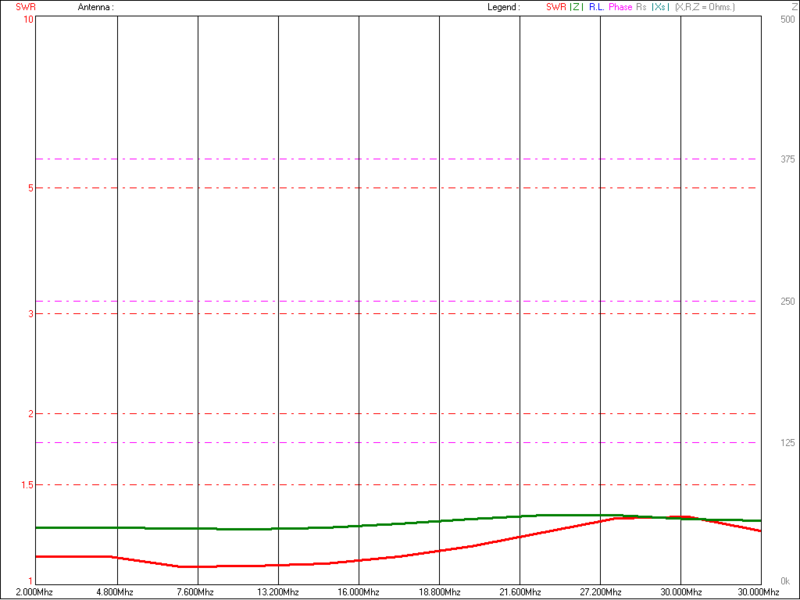 There are similar bumps in the SWR in each graph. 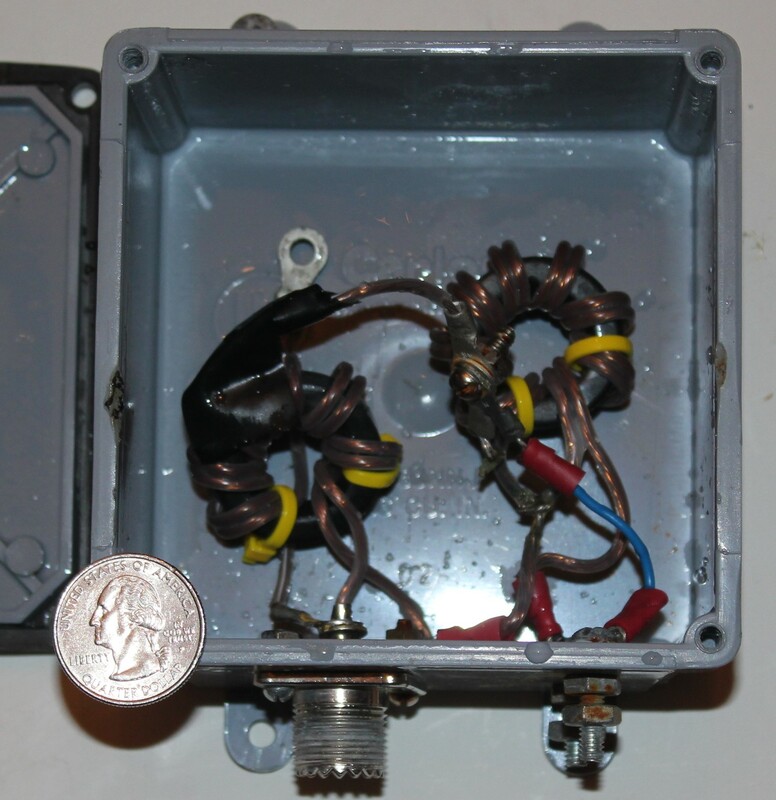 One problem may be that the Home Brew balun was on the test rig for about three weeks in wind and rain. There was substantial water in the device when I opened it. The Home Brew balun probably had more loss compared to the Palomar device which had not undergone the rigors of the weather. 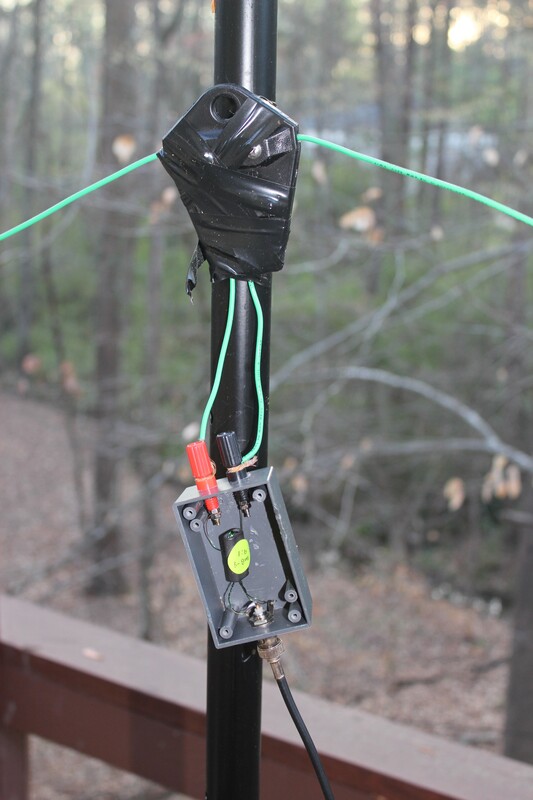 The Home Brew balun was wound with Radio Shack speaker cord, similar to zip cord. One article warns that the speaker wire has more loss than enameled transformer wire. I may have verified this information. Mechanical integrity is necessary in construction. Even though the Home Brew device was locked up tight in a water proof enclosure, the moisture leaked in through small openings where the cable connectors are mounted. A silicon sealant could have been used to keep moisture out. In procuring parts for the enclosure for the Palomar QRP balun, I decided on a BNC connector for the coaxial unbalanced connection, and binding posts for the separate wires on the balanced side of the balun. I got cheap binding posts from China, and regret that decision. They are really bad. One of the best discoveries is that the Elecraft KX3 has an excellent Antenna Tuning Unit. If you look at the VSWR levels on each of the ham bands, most are above 3:1, and some like 30 meters are not within reason for most manufacturers’ internal tuning units. The KX3 handles the mismatches without a problem. I am considering a differently dimensioned Off Center Fed Dipole, this time using one-third of the antenna length for the short end, and two-thirds for the long end. My current test antenna uses 25% for the short end, and 75% for the long part, with the total length being 66 feet. Maybe I can get the matching transformer requirement down to at least a 4:1. Maybe I can find a truly water proof enclosure, too. Jeff, N1KDO suggested that I use a 450 Ohm carbon resistor on the output of the baluns to represent a 450 Ohm impedance to establish a baseline for reference. Having a reference before measuring other parameters can be beneficial when looking at the system performance. I used a 470 Ohm resistor because I had several, and no 450 Ohm resistors. This is just fine, because 470 divided by 9 is equal to 52 Ohms, which is darn close to the coxial cable impedance of 50 Ohms. 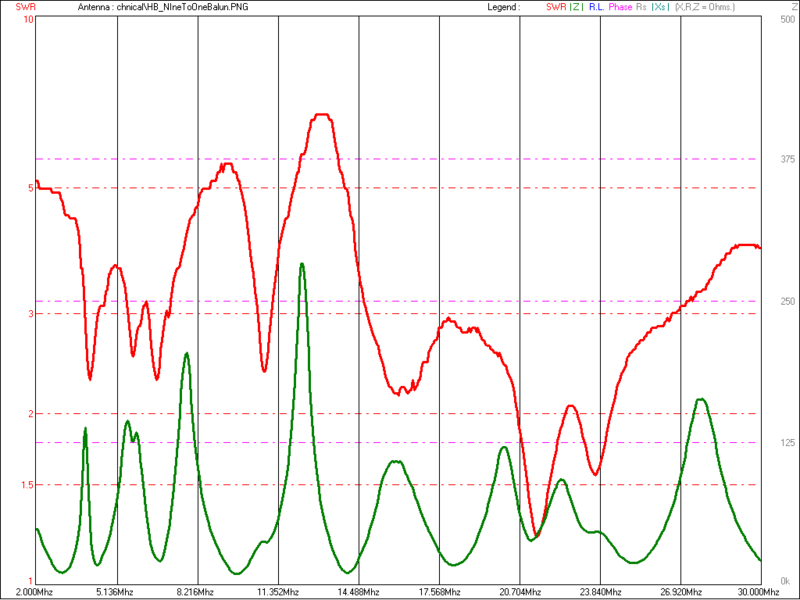 The graphs show the impedance, |Z| and the VSWR fairly level across the 2 to 30 MHz passband. 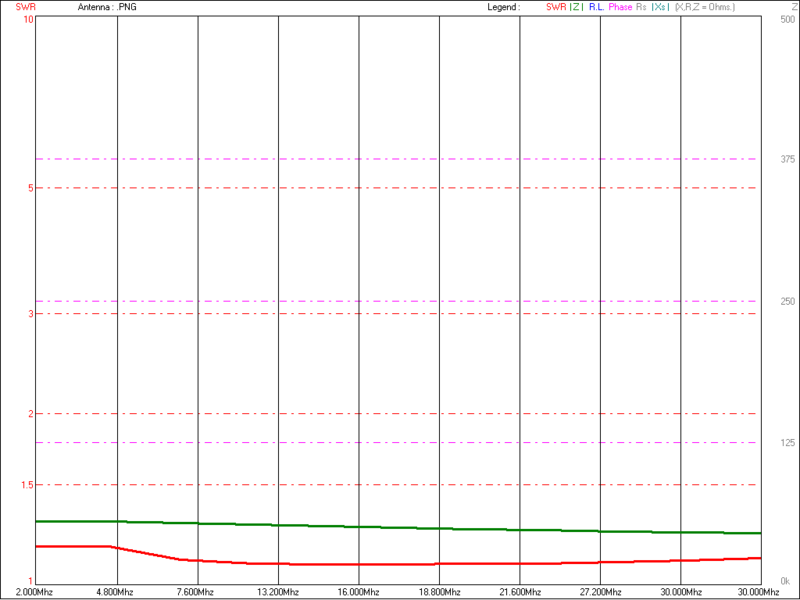 This confirms that the winding ratios are approximately correct. Remember that we are looking at the impedance on the input of the baluns, and it should be very close to 50 Ohms. This means that the balun has transformed the approximately 450 Ohm antenna impedance to one-ninth to match the coaxial cable. 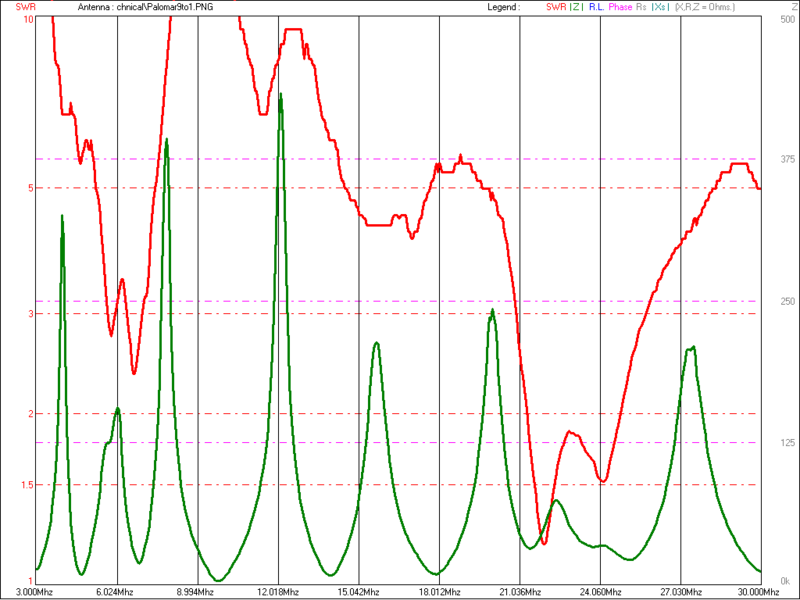 Both graphs show a gap between VSWR and Impedance, but that is not relevant because they are plotted on different scales. What is important is that neither set of graphs are totally level. To me this indicates some minor problems. I found some corrosion in the Home Brew balun, and that may explain the wavering relationship in its VSWR and Impedance (|Z|) traces. Also, the flaky binding posts in the enclosure that holds the Palomar device can be contributing to what I think is an instability in the values across the pass band. It pays to be careful when planning and constructing a project. Thanks for the suggestion. I did sweep the Palomar 9:1 using a 470 Ohm, 1/4 Watt, 5% carbon resistor. Across the HF passband, the VSWR varied between 1.12 to 1.20. I thought that was pretty good. Now, I will have to use the same resistor on the balanced terminals of the Home Brew balun. AS far as where the 9:1 ratio originates, I am not sure, except when I tried a 4:1 on the same antenna, the results were not as good as with the 9:1. I was using an LDG 4:1 transformer balun.